What is a dynamic range? It is a range that can be expanded or contracted in future versions of your spreadsheet. In other words, you cannot foresee the number of used cells in the range at the time of macro creation. It's a necessity while working with real data. Let's record a macro to generate code. The Macro Recorder is a very useful tool when you want to automate a specific task, but don't know how to program it in Excel VBA. The problem with the recorded code shown above is that it was generated for a specific range (D3:D11). 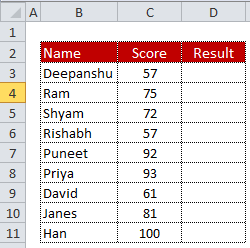 We need to identify the last used row in column C so that we can use it to fill in data below in column D.
How to find last used row? Range("D3").Formula = "= C3 * 2"
What is "Dim last As Long" ? Double is a data type for numeric variable. What is "Range("D3:D" & last)" ? It includes data from cell D3 to the last used row in column D.
Macro recorder does not create very efficient code. You can remove the words like: Select, Scroll. See the difference shown in the image below. 2. Macro recorder does not create code for a dynamic range. The OFFSET function returns a cell that is a specified number of rows and/or columns from the reference cell. Range("A1").Offset(1, 0).Select - It means you want to move one row down from cell A1. The cell selected will now be A2. Range("A1").Offset(0, 1).Select - It means you want to move one column right to cell A1. The cell selected will now be B1. Range("A1").Offset(1, 1).Select - It means you want to move one column right and one row down from cell A1. The cell selected will now be B2. The END property is used to select a range from the active cell to the last entry in a row or column. Range("A1048576").End(xlUp).Select - It is equivalent to pressing the CTRL + UP arrow. Range("A1").End(xlDown).Select - It is equivalent to pressing the CTRL + DOWN arrow. Range("XFD1").End(xlToLeft).Select - It is equivalent to pressing the CTRL + LEFT arrow. Range("A1").End(xlToRight).Select - It is equivalent to pressing the CTRL + RIGHT arrow. Let's rewrite the recorded code using FOR NEXT loop. Range("D" & i + 2) evaluates to Range("D"&1+2) i.e. Range("D3") in the first loop counter. Then the range increments by 1 till last used row. Well, this is it. 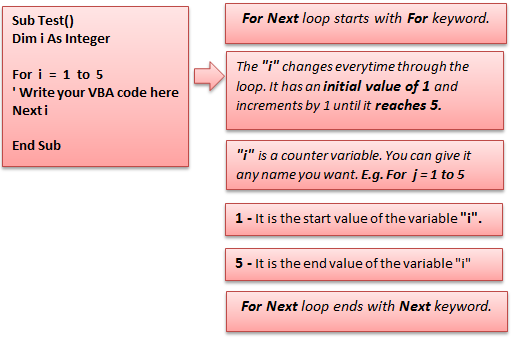 By now, we have covered some basics and intermediate topics about VBA. I hope these four lessons have been effective for you, and have given you a good idea about excel macros. If you're learning to program, you should be programming. Reading basics about VBA is essential for beginners, but without practice, that reading means nothing. 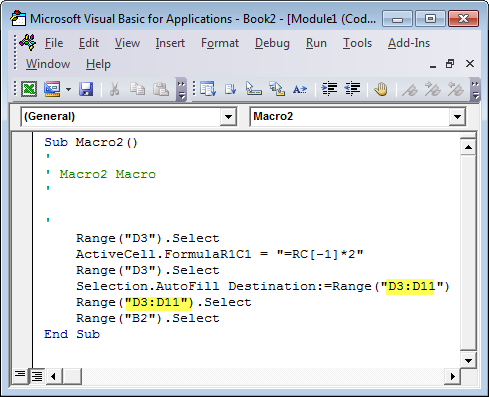 The best way to learn VBA is to keep programming macros on a regular basis. Record Your Macro And Then Make It Efficient And Dynamic. A simple Google search about "Excel VBA" will give you the best materials or VBA code you are looking for. Searching Tip : Include multiple key words to help narrow your search. The following is a list of forums and groups where you can discuss your excel VBA queries. 2 Responses to "Lesson 4 : Playing with Dynamic Ranges in Excel"
I liked the content of this site.